This illustration was a bit difficult getting it to the point where I was happy. 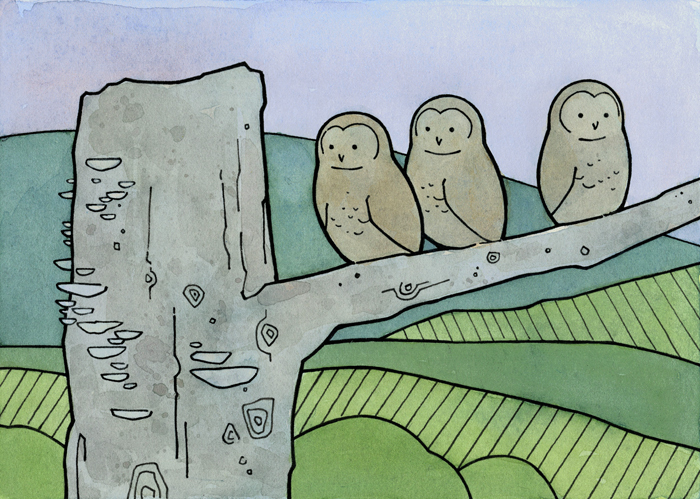 So far it’s the owl illustration I spend the longest span of time on. I kept coming back and adding to it in between working on other projects, never quite sure if it would make the cut. Finally, at the end I added layers of blue over the whole illustration and brought it from daytime into a more dusky time of day. I think it worked and made it a bit more interesting. Overall I’m pretty happy with it and I like the geometric pattern that came about in the vegetation. Are the mushies chicken of the woods ? I love the tree knots- great work ! I hadn’t heard that one before – I had to look it up. But yeh, something like that, or maybe dryad’s saddle. This is adorable. I have to go check out the rest of the series now! Thanks! Glad you found them! I love this- the patterns of the vegetation are really nice and the sky is a great color..